s-scrolls: Decorative motif of scrolls in an "S" shape used in the Rococo period. sabot: Metal "shoe," protective as well as ornamental, on the feet of a piece of furniture. sabre leg: Early 19th century curved chair leg which resembles the line of a sabre blade, most closely identified with the Regency period. First used on the Greek klismos chair. After 1815, a sabre leg was commonly referred to as a Waterloo leg after the Battle of Waterloo. Saint-Louis Cristallerie: The Compagnie des Cristalleries de Saint Louis is one of the most prestigious crystal glass manufacturers in the world. Founded in 1767 in Saint-Louis-lès-Bitche in Lorraine, it's the oldest glass manufacturer in France with roots dating back to 1586 and the first crystal glass manufacturer in continental Europe (1781). Saint-Louis produces vases, original crystal glass accessories and wonderful chandeliers by hand. salon: Literally, "large room." Typically a room in which one receives company or entertains guests. salon set: Complete set of matched furniture for a specific room. Also called a suite. samovar: An urn with a spigot at its base used to boil water for tea. sarcophagus: A rectangular, coffin-shaped box tapering to a smaller size at the bottom. Can be used as a cellarette or tea caddy. Sarreguemines: A French town known for producing majolica. 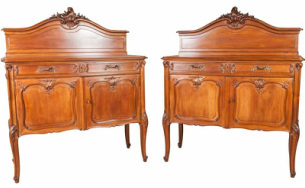 Schmit, Frédéric: One of the greatest French cabinet makers of the second half of of the 19th century, active in Paris at the Rue de Charonne starting in 1856. He received Gold Medals at the 1878 and 1889 Expositions Universelles in Paris. sconce (wall lights): A lighting fixture with one or more brackets that attaches to the wall, often with a mirror or decorative backplate to reflect light. Very fashionable in the late 17th century. Rococo versions are often called girandoles and were usually heavily ornamented with crystals. scrimshaw: A folk art dating from the 17th century in which whale teeth, whale bones and walrus tusks are engraved or lightly carved with a picture or design. scroll foot/scroll toe: A foot in the shape of a carved scroll, typically found on the end of a cabriole or other curved leg. Originating in the Louis XIV (Baroque) period, it's often associated with Louis XV Rococo styles. Also referred to as whorl foot or escargot foot. scroll pediment: Broken pediment with each half shaped in the form of a reverse curve, and ending in an ornamental scroll. Usually a finial is placed in the center between the two halves. secrétaire: French term for secretary. An 18th century tall piece of furniture with drawers at the bottom, a bookcase on top and a desk with a drop-lid in the center. secrétaire à abattant: Tall French writing desk, the top part of which resembles an armoire, having a door at its base. The top is often flap-fronted to provide a large writing surface when open. semanier: A tall, narrow chest of drawers with six to eight drawers, one for each day of the week. serpentine: Furniture decoration shaped like an s-curve. servante: A kind of commode resembling a pantry table meant to be set against the wall. serviette plissé: A linenfold motif or carved motif resembling a folded napkin. Literally, "pleated." settee: A seat with back and arm rests designed for two or more that came into popularity during the 17th century. Most often it is softly upholstered with fabric, anticipating the 18th century sofa. shagreen: The pebbled grey-green skin of sharks and rays. Used since the 17th century for covering small boxes and accessories. shield back: A chair back fashioned in the shape of a shield. sideboard: Originating in England, the sideboard was at first likely just a place to put food while serving — a simple plank set atop trestles or a shelf attached to the wall. Over time drawers and cupboards were added below, as the piece became more important as a place for displaying prized possessions. Usually has short legs or the cabinets may reach all the way to the floor. Similar to a buffet. side chair: A chair without arms. silver gilt: Silver plated with a thin layer of gold, also vermeil. singerie: Decoration depicting monkeys (singes) in human costumes and often comical situations. Associated with Chinoiserie, it was popular during the Rococo period. soupiere: A vase form or urn often used in the Louis XVI and Empire style as the central motif in pedimented tops of beds, chairs and cabinets and at the intersection of stretchers. sphynx: A mythological winged animal, half woman and half lion. Of Egyptian origin, it occurs in all classical schools of architecture and furniture. sterling: A term used in connection with silverware, indicating that the silver is 92.5 percent pure. stile: Upright supporting post on a piece of furniture. stretcher: Strengthening or stabilizing rail, which runs horizontally between furniture legs, often forming X, H or Y shapes. style etrusque: Neoclassical attempt to imitate the decoration on Etruscan vases. Much use of contrasting encaustic color. Popular from 1760 and again in the 1840s.